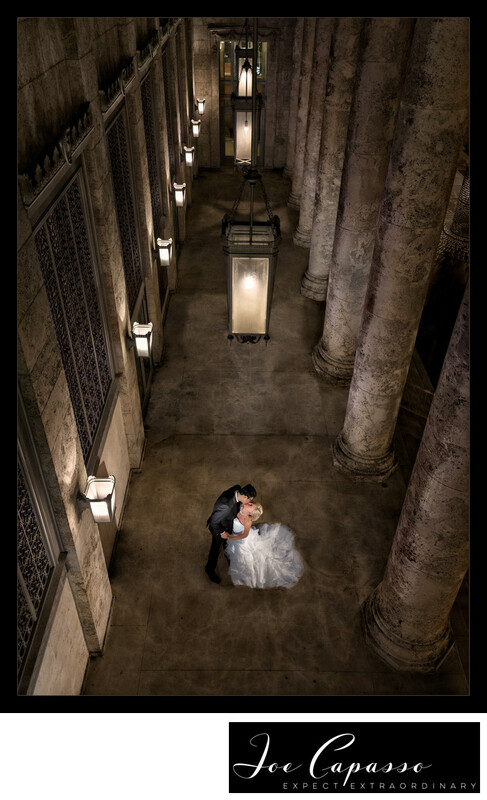 Joe Capasso photography is a Naples Photographer based in Southwest Florida. Joe Capasso photographs weddings at all the popular resorts in Florida including, by not limited to the Ritz Carlton Resort Naples, Florida. The Ringling Museum in Sarasota, Ca'd'Zan Mansion, The Breakers in West Palm Beach, Vizcaya Museum and Gardens, and the Flagler Museum in West Palm Beach. The photo featured here was taken at the Sidney & Berne Davis Art Center in Fort Myers, Florida. Albert and Melissa are both architects in Florida, so we wanted to create an image that captured the essence of the couple. Their wedding venue offered the perfect opportunity. The art center didn't always used to be what it is today. The 23,000 square feet Federal building opened in 1933 as a United States Post Office and attracted visitors from near and far to marvel at its unique architecture and ornate decorative details. One of only a few masterpieces of Neoclassic Revival architecture in Florida, the building's massive columns are made of Florida Key limestone. Its walls are embedded with coral formations and sea shells. The building has undergone an extensive restoration in the past 15 years. However, it's still not complete. The rooftop is set to be converted into a sculpture garden. The art center is one of the more popular wedding venues in Southwest Florida. Location: Fort Myers, Florida . 1/30; f/4.0; ISO 1600; 30.0 mm.